“Thanks to my loyal sponsors from @potcoin and my team at @Prince_Mrketing, I will be flying to Singapore for the historical Summit,” retired NBA star Dennis Rodman literally tweeted on Friday. Remember that VICE HBO segment documenting Dennis Rodman’s “basketball democracy” trip, in which he brought the Harlem Globetrotters to play an away game at Pyongyang, and a lot of people got quietly pissed at VICE, and Dennis Rodman called Kim Jong-un a “friend for life,” no matter what you say about the prison camps? 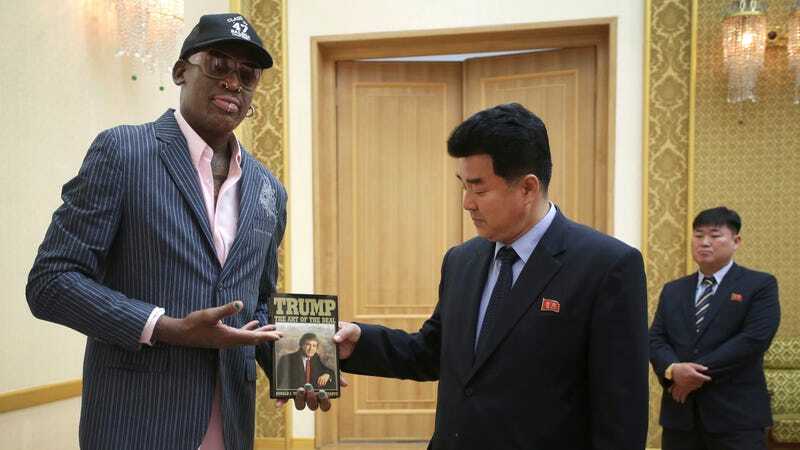 Also remember how Dennis Rodman was on Celebrity Apprentice at one point, and, in June 2017, presented Minister Kim Il Guk with a copy of The Art of the Deal? And remember how David Hasselhoff single-handedly united East and West Berlin in 1989, a picture of democracy manifested in one fabulous star spangled light-up jacket, celebrating both freedom and the only occasion in history which would ever call for that fashion accessory? I don’t want to take all the credit. I don’t want to sit there and say, ‘I did this, I did that.’ That’s not my intention. My intention was to go over and be a sports ambassador to North Korea so people understand how the people are in North Korea. I think that has resonated to this whole point now. And Donald Trump, I don’t ask Donald Trump for anything. I like Donald Trump. He’s a good friend, and I’ve always asked him to talk to me because the people of North Korea and the government over there asked me to talk to Donald Trump about what they want and how we could solve things. When I first asked Donald Trump a long time ago before he became president. He knew I was going to North Korea and he said, ‘Dennis, go over there. It’s a great thing, Dennis. It’s a great thing that you’re doing over there.’ And when I went over there, things looked great. He was happy and stuff like that. And then things changed, and now, since things have changed again, people are calling me, saying why aren’t you getting any credit because you’re the one who brought awareness to everything about the hostages and everyone that’s over there, and all of a sudden, he started letting people go. And I’m like, I’m not the president. I’m just one person. I’m just one person and I’m so happy that things are going well. There will be no science advisor or senior nuclear physicist. This is so far beyond inappropriate that it went all the way around the world and back again! Oh, also buy PotCoin, I guess? What The Hell Did Crazy Dennis Rodman Say In The Bleeped-Out Portion Of This Interview That So Terrified The Interviewer?